When you live in a small rural town, you tend to know a lot of people. Growing up, my cousin’s late husband, “Big Bill”, used to tell me, “yeah, I know a guy…” and I thought that he only had one friend. Since he grew up in New York, I thought that he just didn’t have an opportunity to get to know a lot of people because it’s such a big place. He would laugh when I told him that I knew people too. When I say that I know a guy (or gal), it’s someone I will recommend for farm services….not like Big Bill inferred. I know a guy who hauls logs, one who will deliver mulch, one who will trim donkey hooves, and one owns a wrecker service. 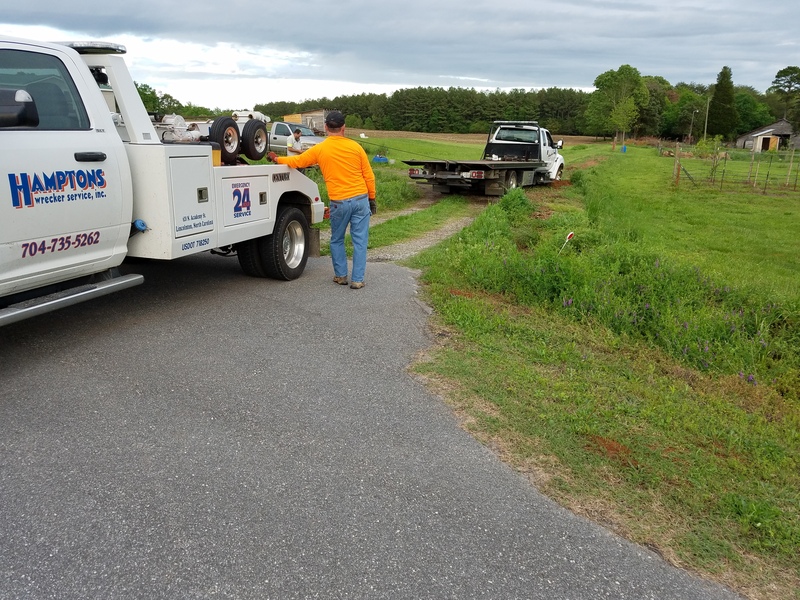 My brother had to call the wrecker service when he discovered that his brake line was bad, thus he needed the rollback to pick up his truck to be serviced. I arrived home, sat on the front porch and watched as a rollback from the local wrecker service got stuck (up to the axle) in mud. After 5 inches of rain in three days, there’s no question that the ground would be saturated. Unfortunately, the rollback driver backed through softer-than-expected ground and was mired. The driver called the owner (who happens to be named Billy) o bring the wrecker. While we waited, I introduced the rollback driver to Bert the goat and set about feeding chickens. 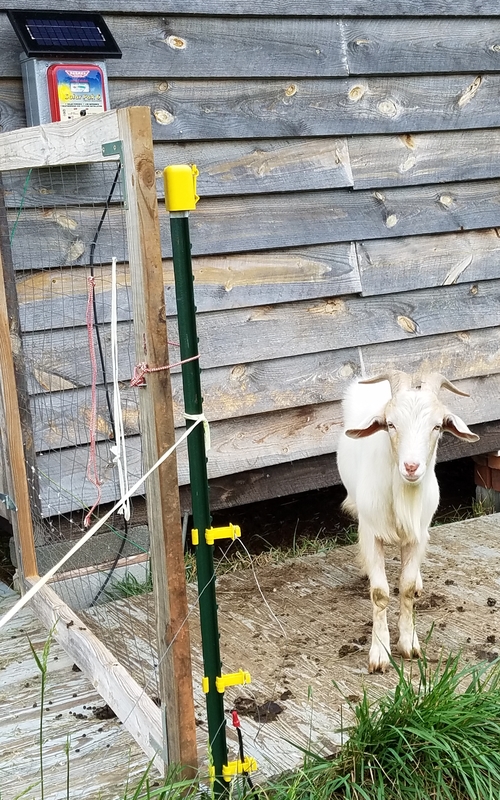 I laughed at Sam the goat demonstrating his dislike of the soggy ground by staying on a wooden walkway and refusing to step into the wet grass for a treat. When Billy Hampton arrived with the wrecker, I thought, “there’s the wrecker guy” as I walked over to say hello. I asked, “How’s your mama?” As he instructed his rollback driver to turn the wheel left or right, he responded and I said, “Please tell her I said hey.” Apparently, it’s not uncommon to have to pull a rollback out of a soft ditch after the rain, but it’s a bit odd for me. A few hours later, the ferrier called to discuss trimming the donkeys’ hooves. We talked about goats, livestock, and the trouble with trimming hooves on mini donkeys. Like many people, we keep mini donkeys as guard animals for the goats. Donkeys, including miniature donkeys will kick a coyote or other predator in the head to kill it and protect livestock. Kicking is their natural, instinctual defense, so if they don’t like pedicures, they will kick the ferrier in response. Sure, donkeys are cute, but they are accurately dangerous. I’ll trim goat hooves all day, but if given the choice, I’d rather a professional trim the donkeys. We’ll help the ferrier by sedating the donkeys. It’s a good thing that I know a vet (who is not a guy)! Next, I’ll need to call a guy about gravel for the driveway….any recommendations?